In The 8th Habit: From Effectiveness to Greatness, the author of The 7 Habits of Highly Effective People urges you to go beyond effectiveness into a whole other dimension of human experience — the potential for greatness. One of the most inspiring and impactful books ever written, The 7 Habits of Highly Effective People has captivated readers for 25 years. It has transformed the lives of Presidents and CEOs, educators and parents — in short, millions of people of all ages and occupations. The world has changed dramatically since this classic, internationally bestselling book was published, influencing tens of millions. The challenges and complexity we all face in our relationships, families, professional lives and communities are of an entirely new order of magnitude. In order to thrive, innovate, excel and lead in what Stephen R. Covey calls the new Knowledge Worker Age, we must build on and move beyond effectiveness toward fulfilment, contribution, and greatness. Research is showing, however, that the majority of people are not thriving. They are neither fulfilled nor excited. Tapping into the higher reaches of human genius and motivation in today's new reality requires a sea change of new thinking — a new mind-set, a new skill-set, a new tool-set — in short, a whole new habit. 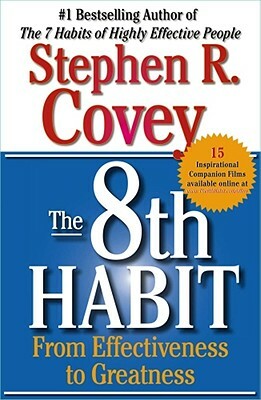 Stephen R. Covey's book, The 8th Habit: From Effectiveness to Greatness, is a roadmap to help you find daily fulfilment and excitement. Stephen R. Covey (1932–2012) was an internationally respected leadership authority, family expert, teacher, organizational consultant, and author. His books have sold more than 25 million copies in thirty-eight languages, and The 7 Habits of Highly Effective People was named the #1 Most Influential Business Book of the Twentieth Century. After receiving an MBA from Harvard and a doctorate degree from Brigham Young University, he became the co-founder and vice chairman of FranklinCovey, the leading global professional services firm.